The heady scent of elderflowers is transferred wonderfully when made into an Elderflower cordial. 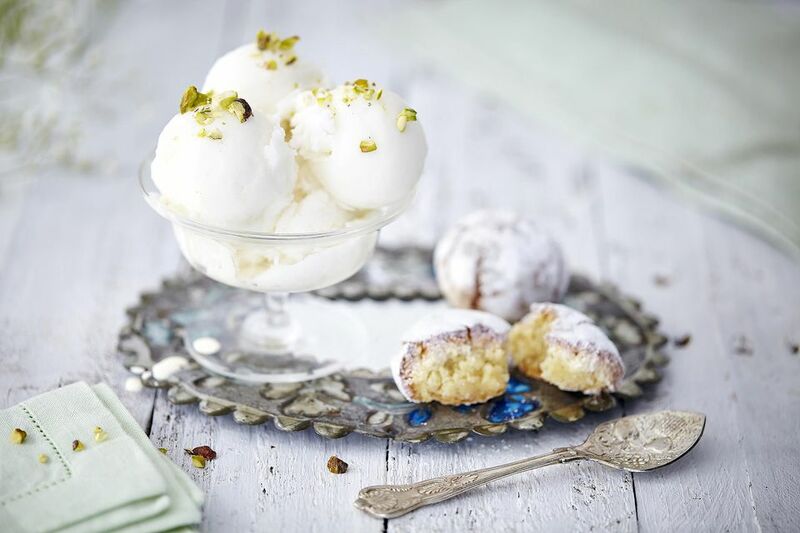 In this Elderflower and Honey ice cream recipe, the cordial is put to very good use. The recipe also uses creme fraiche which is a lightly acidualted cream and gives a lovely tang alongside the sweetness of the honey. If you don't have an ice cream machine, don't worry, this recipe uses liquid glucose which helps to create a smooth ice cream and prevents crystallisation so can be made without a machine. Just follow the directions below for guaranteed success. You will be so glad you did. Meanwhile, whisk the egg yolks in a large roomy baking bowl until light and fluffy. Continue whisking whilst slowly adding the warmed milk. Then add the egg and milk mixture back to the milk in the pan and whisk thoroughly. Return the pan and the cream to the gentle heat and continue stirring until the cream has thickened. Do not allow the cream to boil, if you feel it is cooking too quickly, or sticking to the bottom of the pan, remove it from the heat to allow it to cool a little, lower the heat then continue cooking. The more time you take over this part the better the cream will be in the end. Strain the cream through a fine sieve and put to one side and allow to cool. Once the custard base is cool, add the creme fraiche, the whipping cream, cordial and honey and stir well. Either churn in an ice cream machine following the manufacturers instructions, or, pour the mixture into a shallow freezer container and place in the freezer. Beat the mixture three or four times as it freezes to break up any ice crystals and to create a smooth ice cream. Once frozen, cover and store until needed. Remove the ice cream from the freezer ten minutes before serving to soften it a little. Serve in the prettiest glasses or bowls and if you like, for an extra texture, sprinkle with lightly crushed pistachio nuts, and if desired, drizzle over even more honey (definitely optional). Liquid Glucose is a thick, clear, sweet syrup. This syrup is mainly used in a desserts, cakes, confectionery and occasionally in jam making. Adding liquid glucose to your recipe helps control the formation of sugar crystals which is especially useful in ice cream or frozen desserts. This addition helps to stop the dessert freezing hard and solid and thus making it hard to eat. There is no alternative to liquid glucose which does not alter the taste. In the UK use golden syrup one for one in the recipe. It is thicker and darker so it will change your dish a little but does work well. Outside the UK, use Corn Syrup.